Visiting other clubs is fun, and helps promote square dancing! You get to meet other dancers, dance to different callers, and get ideas that can help you make your own club better. 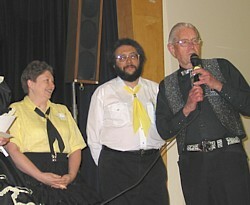 Mary Gingell (left) and Joe Dehn (center) were recognized on 31 May 2003 for completing the 100% club visitation program. George Holser (right) was the first dancer to complete this SCVSDA program, back in 1973. 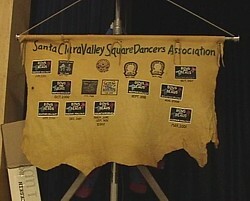 To be recognized for 100% visitation, a dancer visits and dances with every SCVSDA club within a one year period -- plus attending one Whing Ding and one Delegates meeting. To take the Buckskin, your club must bring 16 dancers (or your whole club, if smaller) and a caller to a dance where the Buckskin is displayed. This can be a regular dance of the club that currently has the Buckskin, or any Whing Ding. If more than one club qualifies, a winner will be picked at random from the qualifying clubs. A club cannot reclaim the Buckskin for 30 days, unless in the meantime it has been claimed by another club. For additional information see the Standing Rules. The Buckskin is currently held by Bows and Beaus.